Since it opened in the year 2000, the Archway has stood as an enduring tribute to the adventurers who traveled the Great Platte River Road though Nebraska and helped to build America. Over the years, we have welcomed and inspired over 1.5 million visitors with our story. The Archway celebrates the American spirit of adventure. The visitors to the Archway will experience the courageous adventure of the Great Platte River Road in the settlement of the American West. Need the latest on The Archway? With our newsletter, guests and supporters can read about the latest events The Archway hosted as well as upcoming events, recent press releases and announcements. Please contact Marketing Coordinator Mark Foradori (308.237.1000 | mforadori@archway.org) with any questions. Join us for an all-day fishing adventure at the Archway. Just because school is out today doesn’t mean children in grades K-5 can’t learn something and have fun doing it! The Archway is teaming up with Bass Pro Shops/Cabela’s and the 4-H Extension office to offer a series of day camps when KPS students are out of school. The $30 registration fee includes an entire day of activities and lunch is provided. Pre-registration is required. Call Jill Epley at the Archway at (308) 237-1000 for information and to sign-up, today! Sponsored in part by Bass Pro Shops/Cabela’s, the 4-H Extension Office, and Runza. Police officers, firefighters, National Guard members and emergency medical technicians will join with Heroes Week Campers for special projects that help children understand the important work these heroes do every day. The week will be filled with fun, hands-on activities and interactive play and will end with a special presentation for families and friends. Presented in partnership with Crane River Theater. Designed for students in grades K-5. May 28-31 from 9am – 12pm. Cost $40/student. Registration opens on April 1. Heroes Week is presented with the support of the Peter Kiewit Foundation, the Arram Family Foundation, the Theodore G. Baldwin Foundation and First National Bank. Part of the Archway’s Day Camping Through The Decades program, Archie’s Prairie Adventure Day-Camp combines a little history with a lot of fun. Participants will meet historical characters, learn to play pioneer games and enjoy crafts and group activities. Day Camping Through the Decades is designed for students in grades K-5. The cost is $35/student. 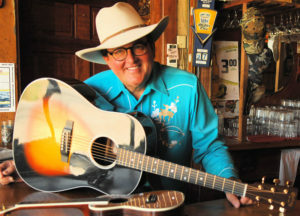 Join Kearney’s own Jim Salestrom for this tribute to his friend John Denver. 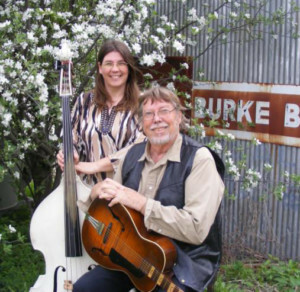 Salestrom played banjo and sang backing vocals on Denver’s Different Directions album and performed in concert with John Denver. Admission for this special show is $10/each. Admission for students is $7/each. Tickets are available for purchase at the door. Part of the Archway’s Day Camping Through The Decades program, Archie’s All-American Adventure Day-Camp combines a little history with a lot of fun. Participants will meet historical characters from the period 1910-1950, learn to play vintage games and enjoy crafts and group activities. Day Camping Through the Decades is designed for students in grades K-5. The cost is $35/student. The Archway teams up with the Nebraska Game and Parks Commission to present this evening fishing event that the whole family will enjoy. Join us for fishing on the Archway ponds. No experience or equipment is required. 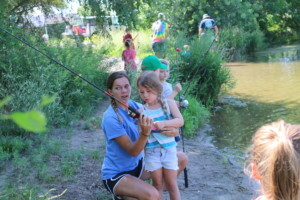 We’ll provide fishing poles and tackle along with coaching for beginners. The event is free and no registration is needed. Part of the Archway’s Day Camping Through The Decades program, Archie’s “Old School” Adventure Day-Camp combines a little history with a lot of fun. Participants will meet historical characters from the 1950s – today, learn to play “old school” games and enjoy crafts and group activities. Day Camping Through the Decades is designed for students in grades K-5. The cost is $35/student. Since prehistoric times, the path along the Platte River through Nebraska, once known as the Great Platter River Road, has served as a migratory route across the continent. From the Oregon Trail era to today, the Archway brings the story of the Great Platte River Road to life. The heart of the Archway experience is our historical exhibit that pays tribute to the American spirit of adventure. Using life size figures and personal audio guides, the Archway tells the story of the building of America. At the Archway, you’ll walk with the pioneers over the Oregon Trail. Watch a rider switch horses at a Pony Express Station. Hear Mark Twain’s account of a cross country stage coach trip. Relive the driving of the “Golden Spike” that united the nation’s railroads. Visit a traveler’s campground to hear stories of life on “America’s Main Street,” the Lincoln Highway. Spanning I-80, today’s coast-to-coast travel corridor, at Exit 275, the Archway celebrates the lives of all of the adventurers who follow the river’s path, those of the past, who helped to build our nation, and those of today, who will shape our future. The Archway was originally conceived by Frank Morrison, the 31st Governor of Nebraska, who served from 1961-1967. It was his dream to create an enduring monument to the adventurers who followed the Great Platte River Road and helped to build America. Imagine the daring and determination of the people who first traveled the Oregon Trail, the high-spirited adventure of racing to California during the Gold Rush of 1849, the devotion of the Mormons who moved west in search of religious freedom, the entrepreneurial spirit that lead to the creation of the Pony Express, the industry that built the Transcontinental Railroad and the cooperative effort that lead to the creation of “America’s Main Street,” the Lincoln Highway and the Interstate Highway System. Individuals of vision and courage found ways to work together to turn their dreams into reality and to contribute to an enterprise that was much bigger than themselves. The Archway tells this evocative story and seeks to inspire current day adventurers to face today’s challenges with courage and tenacity in order to continue to build a nation in which we can all take justifiable pride. The Archway’s historical exhibit, shop, theater and event room are housed in a dramatic structure that spans I-80 at Exit 275. The building’s exterior was designed to emulate a covered bridge. The colors on the arch’s surface represent those of a Midwest sunrise. Talk about American ingenuity! The engineers in charge of building the Archway were faced with the challenge of erecting a 1,500 ton structure that would eventually be suspended above one of the most heavily traveled highways in the Midwest without impeding the regular flow of traffic. They decided that the best way to accomplish their task would be to build the two supporting towers on either side of the highway and build the arch portion of the structure separately, at ground level, near the highway. When all of the elements were ready, the most complex segment of the project was implemented. First, using hydraulic jacks, the arch section of the building was lifted 22.5 feet in the air. Then, it was jacked horizontally on to heavy duty, self-propelled modular transporters that would carry the structure across the highway. The process of lifting the structure on to the transporters took eight days. On August 16, 1999, a section of the interstate was closed and at 10:00pm, the transporters began their work of slowly moving the structure across the highway. By 6:00am on August 17, the arch segment was in place over concrete abutment walls that are 60 feet long, 25 feet tall and 2 feet thick. The arch segment was welded into place and finishing work began. The Archway opened for visitors on June 9, 2000. Since that time, over 1.5 million visitors have toured the historic exhibit and have been inspired by the Archway spirit of adventure.